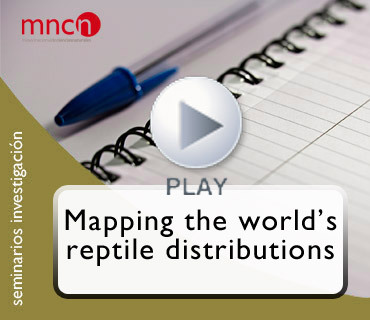 Research seminar: Mapping the world's reptile distributions. Over the past 10 years I have been coordinating a group trying to map the distribution of all the world’s reptile species. We are now very nearly finished. I will tell a tale of why and how we went about doing it, what were, and are, the difficulties and shortcomings, and the stunning results. I will discuss what scientific questions these distribution data has enabled us to explore, what we use them to study now, and what are some of the ideas we have for future research. Presenta: Joaquín Hortal, Departamento de Biogeografía y cambio global, MNCN-CSIC.